Are there early-bird pledge levels? No. We know that many project creators like to offer early-bird pledges to spike the early numbers of a campaign, but we feel that all backers deserve to feel like they’re not missing out. What is the age appropriateness of the game? 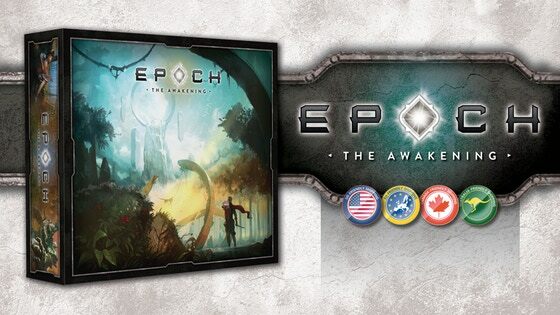 While the game is family-friendly with mild war themes, Epoch is a complex game with depth and layers. There’s a good deal to absorb. We’ve labeled the game as recommended for gamers 14+. It might be playable by some gamers slightly younger. The 14+ age recommendation also allows classifies Epoch as a game, and not a toy when importing into the EU. Will everything fit in one box? Yes. The Swanky Version of the game will have all of the components, miniatures, mini-expansions and stretch goals neatly engineered to fit inside the box. The base game will simply not have those extras, but will use the same box. Can I pledge after the Kickstarter campaign? To take full advantage of the special pricing, you’ll want to pledge during the Kickstarter campaign, but late pledges will be handled by BackerKit after the campaign ends—at a higher price. We can’t make any guarantees as to how long late pledges will be available. What happens if my game arrives damaged? If your game arrives damaged, please send us a photo. Please understand that we can’t control the product after it leaves our hands. If the damage is severe, we will offer partial reimbursements or replacements on a case-by-case basis. If the damage is a slight scratch or ding, we’ll ask you to be understanding and not ask us to carry the financial burden of replacing a game because it isn’t flawless. We'll always do everything we can to make it right. Is there a retailer pledge tier? If you are a retailer with a brick-and-mortar store, please email us at www.orangenebula.com and we will get you setup with wholesale pricing that protects your ability to serve the gaming community profitably. What size are the cards, and will the box accommodate sleeves? The cards are 70mm square, which is a common sleeve size. Yes, the box will be engineered to hold sleeved cards. The die-cut shape will be refined so as to not interfere with easy shuffling. Why is shipping to some countries so high? The shipping prices listed are lower than our costs, especially considering freight and handling. We've done our very best to subsidize the shipping costs for every country. If there is a glaring disparity with a particular country, we'll do our best to make an adjustment. We are looking into localization seriously. I cannot guarantee that it will happen, specifically for the game components (cards) as this requires entirely new versions of the game. However, it is quite possible if we meet our funding goal that we will release versions of the Visual Guide in a handful of languages including Spanish, French, German, and possibly others. Is the Swanky version necessary to play the game? No. The mini-expansion and the miniatures are add-ons that will hopefully increase the value of the game and the gaming experience for you. Why is it called the "Swanky" version? Because "Super-Swanky Version" seemed a bit much. Are there early-bird pledge levels? What is the age appropriateness of the game? Will everything fit in one box? Can I pledge after the Kickstarter campaign? What happens if my game arrives damaged? Is there a retailer pledge tier? What size are the cards, and will the box accommodate sleeves? Why is shipping to some countries so high? Will the game be available in other languages? Is the Swanky version necessary to play the game? Why is it called the "Swanky" version? I want to know when my reward is shipping. I am having trouble filling out my survey. I would like to make a change to my pledge. I would like help with preorders. I have a issue with my pledge finances. I have a question for the project creator. I have a question not listed here. I want a refund for my initial campaign pledge. I have a question about BackerKit.